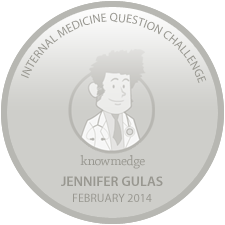 The Knowmedge Internal Medicine Question Challenge has come to a close and we’re excited to announce the winners! 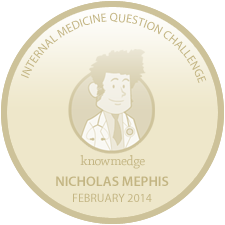 During the past month, over 80 contestants from across the globe joined us in the Knowmedge Internal Medicine Question Challenge. The contest awarded participants points for answering a series of 25 questions, pulled from a diverse set of topics: Hematology, Nephrology, Neurology, and Rheumatology. One additional note: This past week, a few participants informed us that their Facebook privacy settings prevented us from viewing their Sharing activity. As a result, we were unable to award them the points for shares they may have otherwise earned. As a matter of fairness, we analyzed our point totals and reviewed what the results would look like if we removed bonus points from the scores of all participants and if we kept them as is. In both cases, the top 4 rankings appeared unchanged. Without further delay, please join us in congratulating the following participants for their impressive performance! In addition, SHAILESH MANANDHAR is the winner of the raffle to receive a free 1-month subscription to the Knowmedge Internal Medicine QBank. Congratulations Nicholas, Jennifer, Kuldeep, Yatzel, and Shailesh! – Please send us a direct message on facebook to receive your award.